Given the balloon’s flight, it is notable that it was not relayed by VK2AWM-1 (which was 40km closer), VK2RAG-1 and VK2RTZ-1 at Gosford and Newcastle, and at least four igates in Wollongong, Sydney and Newcastle. Transmitting blind increases the risk of collision to approximately equal to channel busy which was probably in excess of 40% for part of the time. 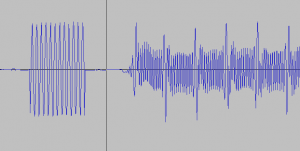 The answer to the modulation quality issue lies in analysis of a recording I managed to make of the received audio. 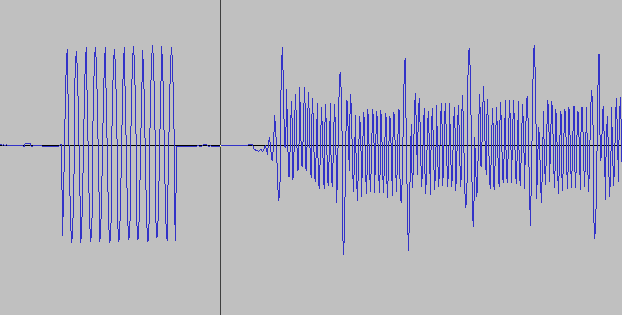 Above is a small snippet of 1kHz test tone @ 3kHz deviation, then a snippet of the preamble of the balloon. This is an all too common scenario where the low tone is much stronger than the high tone, and twist as it is known, degrades demodulation. The measured twist is 7.4dB which for example exceeds the specification for a MX614 modem chip. Within the limits of accuracy of the measurement method and calculations, the transmitter is modulated to around 3.25kHz equally for both high and low tones. It has no pre-emphasis. A more correct setup would be 3kHz deviation at 2200Hz and 1.6kHz deviation at 1200Hz which would result in the two tones in the receiver output being approximately equal in amplitude. There is a widespread belief in ham radio that AFSK works better without pre-emphasis. There is very little difference between pre+de-emphasis and none, so long as both ends use the same scheme. This example demonstrates the folly of mismatched pre/de-emphasis. The balloon must emulate that pre-emphasis curve for optimal performance with common radios. This often all starts with someone over-driving a transmitter, effectively wiping the pre-emphasis due to limiter action, and a repeater owner compensating for this by removing de-emphasis in the receiver… so reinforcing incorrect setup at the expense of weak signal performance for the stations that are properly modulated.